Key Points:-The General Aux Quality Juicer Mixer Grinder is a kitchen companion that can work wonders for you. This device is specially designed with flow breakers for efficient mixing and grinding performance. It comes with a chutney jar a liquidizing jar and a grinding jar of . The metal sieve is coupled with plastic for durability. This device has a power indicator and a cord winder. 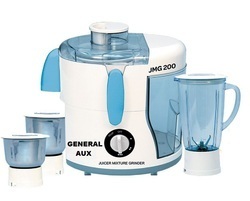 KEY FEATURES:- The General Aux Quality Juicer Mixer Grinder is a kitchen companion that can work wonders for you. This device is specially designed with flow breakers for efficient mixing and grinding performance. It comes with a chutney jar a liquidizing jar and a grinding jar of . The metal sieve is coupled with plastic for durability. This device has a power indicator and a cord winder. Looking for Grinder Mixer ?